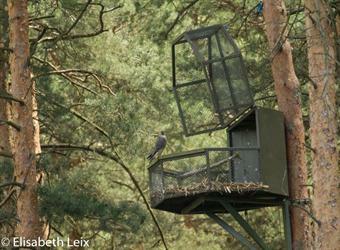 In the 1970s, falconers developed breeding and release to restore raptor populations, here for tree nesting peregrines. Humans tend to increase their impacts on nature unless they plan carefully. There may be a need to provide more food, buildings, transport and jobs. However, if we can put nature back wherever possible, and help to link it up again, we can make our environment richer, healthier and more enjoyable. Many opportunities for restoration exist, on road verges, edges and corners of fields, in town parks and even on top of buildings. The International Union for the Conservation of Nature (IUCN) has produced guidelines for restoring species. The Guidelines on Reintroductions and Other Conservation Translocations are based on many projects with many species and are therefore long and detailed. However, decisions about whether to restore local species, especially of plants from nearby sources, can be quite simple. BEST PRACTICE provides a simple decision tree that will refer projects to the IUCN guidelines if difficulties could arise. MAPPING areas for possible restoration could benefit from use of the tool in our section on Habitats and Species. Please REGISTER, and if possible DONATE, to help us build up guidance for communities and managers on restoring nature and natural habitats across Europe.